St Ceneri le Gerei, situated (just) in the Orne department, is known as one of "les plus beaux villages de France", and forms part of the region known as the Alpes Mancelles. Perched on a rocky spur in a bend of the river Sarthe, the village, with its picturesque grouping of granite houses, has attracted visitors since the 19th century, when painters such as Corot came to immortalise the rural splendour of the setting. Their interest is commemorated in the "Auberge des Peintres" and in the yearly painting festival, when a selection of invited painters draw thousands of visitors. The village is also home to a number of artists and artisans on a permanent basis. All this is very different to the origins of the village; when the 7th century Italian St Ceneri found this corner of Normandy, he came to escape the outside world and to build a hermitage. Today there is a charming small 14th century chapel on the site of the hermitage. The chapel still contains a statue of St Ceneri, together with the stone that is reputed to have served him as a bed. Tradition has it that girls who wish to marry in the coming year must push a pin into the heel of the stone statue to have their desire come true - also that if any woman lies on the stone bed, she will shortly afterwards become pregnant. 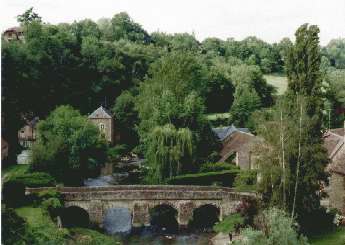 Beliefs and superstitions lie thick about this pretty little village - on the opposite river bank to the chapel is a spring reputed to have the power of healing ailments of the eyes; it is also said that if a woman who has committed a crime approaches the spring, the waters will run dry.